We were recently cutting down a tree in our back yard that was infringing on a portion of our view and just before I took the chain saw to the last of the limbs, my wife came up with the brilliant idea of keeping the remaining limbs and building birdhouses to put on them. So now we have a high-rise condo for the birds! I’ve always wanted to build some birdhouses and we have eight of them. There are actually a couple of potential spots left but I think it’s getting a bit dense in the neighborhood! I know some birds do not like to nest in close proximity to others but they’ve only been up there a few days and the birds are already investigating, standing on the tops and hanging on the front to peer into the holes. But this project is as much a yard sculpture as it is a home for the birds! You wouldn’t believe it but the tree looked kind of off balance at first so I actually added the branch sticking out to the right of the sign. I took one of the branches we had cut down, trimmed it to fit between the other branches and screwed it in place. The tree has already started growing again so I guess I’ll just prune it around the houses as it grows. After reading the great material available on this web site for bird house carpenters, I proceeded to build them. As suggested in your guidelines, they all have double fronts as a predator guard, ventilation slots or holes near the top, floor drainage in case rain gets in, screen stapled inside below the hole so baby birds can climb out and one side opens for seasonal cleaning. And the houses and holes are sized according to the chart you provide for various bird species. I experimented with Alaskan spruce, cedar, pine and walnut as well as smooth and rough textures and various environmentally friendly stain colors. Only one of the houses is left entirely natural (I wasn't familiar with Alaskan spruce and wanted to see how it will weather) and the others are stained on the exterior except for the walnut house which is oiled. I left the insides natural as I read that it’s not good to put anything on the inside for the health of the birds. I manufactured some tiny cedar shingles for some of the roofs on my band saw and they came out pretty nice. And I cut the corners of the shingles on one of the cedar houses for a more ‘cottage’ look. I've always been a woodworker but I can’t tell you how much fun I had making all of these bird houses! Thank you so much for the wealth of information you provide on your web site! John, you did a great job on your "Birdhaven." Just adorable and well built. You'll have to write about whether all 8 get used for nesting, and how the "families" get along during that time. We just had our first pair of Carolina wrens to nest under our carport this spring, and I read about them. They are not migratory, and if no provision is made, they freeze or starve to death in winter. I bought a "convertible" wren house that can be used for nesting and then you change the front panel to put the opening near the bottom and slide in dowels for perches so that several wrens can combine body heat in winter. I'm going to put out suet and seed, too. With your talents, you probably could make your own. What fun ! It will be interesting to see how many houses get tenants for the season. 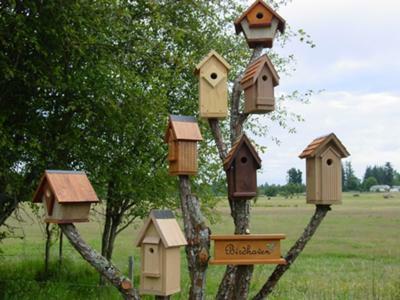 I have also wanted to learn to build birdhouses....maybe will try that in retirement, which I wish would hurry up! Enjoy your new bird apartment complex!